We're open all year, allowing you to take advantage of the best of any season for your New Hampshire vacation. Although we're certain you'll be impressed with the quality of the rooms at the inn, we're even more certain you'll be impressed with what's outside. Our grounds and surrounding views are yet another feature of the inn that sets a visit here apart from the typical hotel stay. 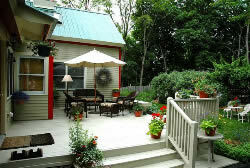 The photos below are from the grounds of the inn and offer a hint of the beauty that not only surrounds North Conway, but surrounds the very Inn itself. 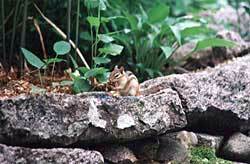 This is a small corner of our grounds, which are home to a family of friendly chipmunks who LOVE sunflower seeds. 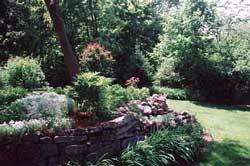 The grounds of the Inn are landscaped throughout with abundant perennial gardens. 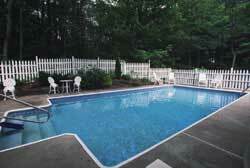 We also have an in-ground pool, complemented with its own extensive juniper bed. This is the view across the valley most nights, with the sun setting behind the Moat Range and providing wonderful, natural ambiance for your romantic weekend getaway. 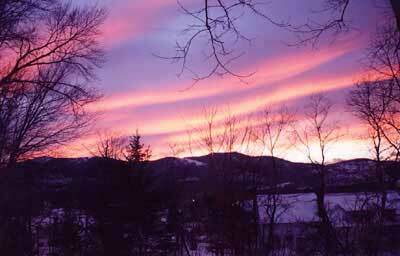 Although this is during the winter, summer sunsets are no less spectacular at our lodging in North Conway, NH. Just to the right of this photograph is Cathedral Ledge, which is a ten-minute drive from town to the top of the ledge overlooking our valley.